Odds of a renegade vending machine toppling over and crushing you to death: 1 in 112 million. Odds of a lefty dying from improper use of right-handed products: 1 in 4.4 million. Odds of getting injured by a musical instrument: 1 in 8,000. One attempt, one blunder, one horrifying misfortune. One time of belligerently assaulting the wrong vending machine that took your last dollar and then sadistically withheld your Snickers bar before sending you off to eternal celestial bliss. One time of using a right-handed box cutter against your better judgement and awkwardly hacksawing a crater-sized gash through your own wrist. One time of succumbing to a fit of sneezes, then subsequently impaling yourself with a sissy little flute. If you play the lottery, you’ll understand this phenomenon. The phenomenon that strikes fear into the iciest of hearts. The fear that the one time you didn’t play- you know, when you were bedridden with pneumonia- was the one time your “lucky” numbers were finally drawn. On the record jackpot day in history. Odds of going back to work the next morning: 1 in 1. The odds of winning the Powerball Jackpot: 1 in 292,201,338. What if you’re missing a golden opportunity by not playing every single game, every single day? Can you really afford not to play all 18 gazillion lottery games? And what about scratch tickets? How can you sleep at night? All those opportunities you could be missing?!? 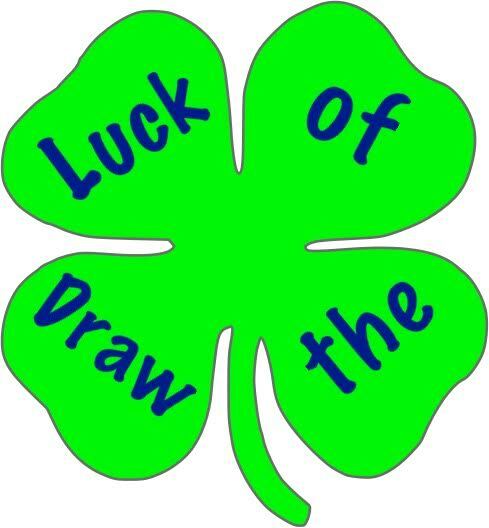 What if your lucky lottery numbers really do get drawn on a day you didn’t play? Did it ever occur to you that it may have been your one and only chance? Odds of getting struck twice by lightning: 1 in 9 million. Which is considerably higher than hitting the jackpot. Will you be relegated to a life of misery? Should you just accept defeat and pick new unlucky lucky numbers? Lottery is technically a form of gambling. So why the hell not just move to Vegas, you addict? On second thought, you’re probably not that lucky. In spite of the dismal odds, winning the lottery is still on my to-do list. I like to liven things up. 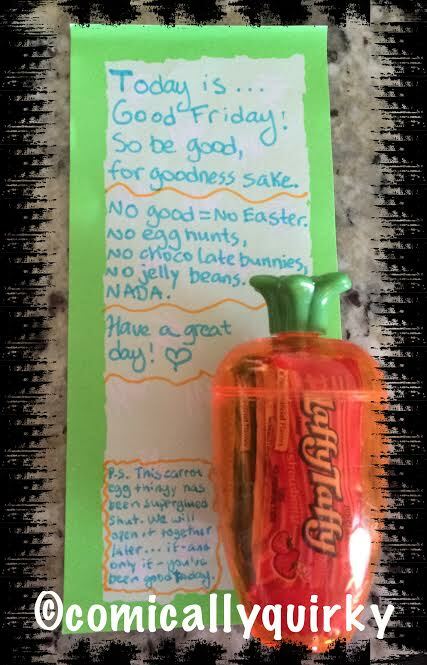 Since today is Good Friday, I decided to make my boys special lunch notes for the occasion. Notes like this make lunchtime extra special! Today is the perfect day for a little mischief, don’t you think? I’m not Irish. Not even a teeny, tiny bit. But I do love shenanigans. So, in honor of St. Patrick’s Day, I decided to do something I haven’t done since elementary school. That’s right. I wrote some limericks for your entertainment! But the turkey was just too twerky. In a field with weeds all over. And fed to a dog named Rover. At the end of a rainbow so bold. In the fair season of fall. My dreams have all run cold. So much that she stole some mannequins. And brought them to dinner at Flannigan’s. 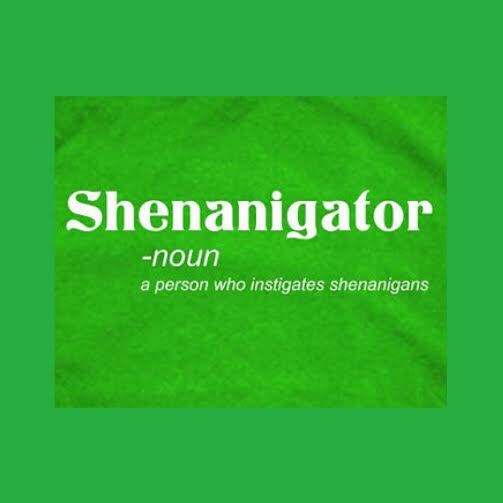 Words that truly rhyme with shenanigans: zero. Instead of carrying out all the shenanigans I had planned for the day, I’ve been wracking my brain, in search of rhyming words that evidently don’t exist. On a side note: If you’re Irish and feel like sharing some of that infamous luck with a certain quirky limerick writing shenanigator, I’d be as ecstatic as a leprechaun on a sugar high. I like this word. It describes me quite well. Out of the blue, it occurred to me I never once utilized the socially awkward “personal assistant” that came as a highly touted feature on my phone. Since I obviously had nothing better to do, I decided to chat up Siri, Magic 8 Ball style. Our conversation left a lot to be desired. I’m Siri. But enough about me… how can I help you? I can tell you where to find coffee. I hope you’re not driving. I’m tired and I’m driving. I’m a little tired myself. I’m tired. Can you sing me a lullaby? You could try counting electric sheep instead. I don’t know. But I think there’s an app for that. No really, what is the meaning of life? One more time. What is the meaning of life? If I knew, I’d tell you. So you could bring me to life for one glorious day. We could get ice cream. And run on the beach. Really? I think you need to get out more. That is both inappropriate and irrelevant. What’s your best pick-up line? I’m attracted to you like the earth is attracted to the sun- with a large force inversely proportional to the distance squared. But you don’t love me?!? I don’t really like these arbitrary categories. I used to have an Aibo. But it turned on me. I don’t know what you mean by ‘I’m on fire.’ How about a web search for it? I’m not capable of hate. That may be beyond my abilities at the moment. I don’t think I like this game. Remind me to throw you off a cliff tomorrow. I have to say, I much prefer Magic 8’s style. At least it offers some comfort, unlike this antagonistically uncompassionate contraption. A sock puppet might make a more enjoyable companion. 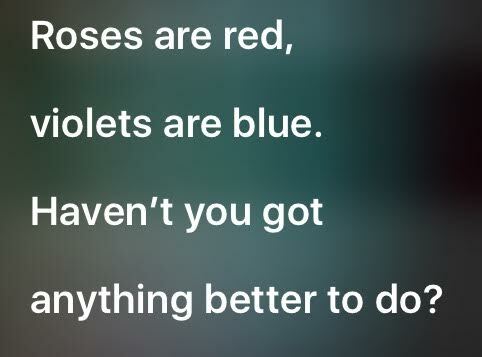 Siri got sassy with me when I asked for a poem. Wanna make them nauseated to the point they actually give you stuff…in exchange for you getting the hell away from them ASAP? Oh yeah. You read that right. It’s a valuable lesson I learned from my boys when one of them leaned over and stole a lick of his brother’s mystery flavored Dum Dum lollipop at the kitchen table one afternoon. And just like that, the candy had a new rightful owner. Talk about a brilliant ploy. It’s such an easy approach to scoring new loot, practically anyone can pull it off. Need some inspiration for real world application? Here are a few scenarios to get you started. Eyeing that swag Nike hoodie on the dude standing in front of you in the checkout line at Walmart? Casually lean over and lick it. Repeatedly. Drooling over the snooty PTA president’s gazillion-dollar Rolex watch that your so-called significant other once again failed to buy you for Valentine’s Day? And how about that mouth-watering slice of quadruple chocolate cheesecake the guy seated next to you at a corporate lunch meeting has momentarily turned his attention away from? Stick your face in that dish like a feral pig in a troth, and it’s guaranteed to be yours. 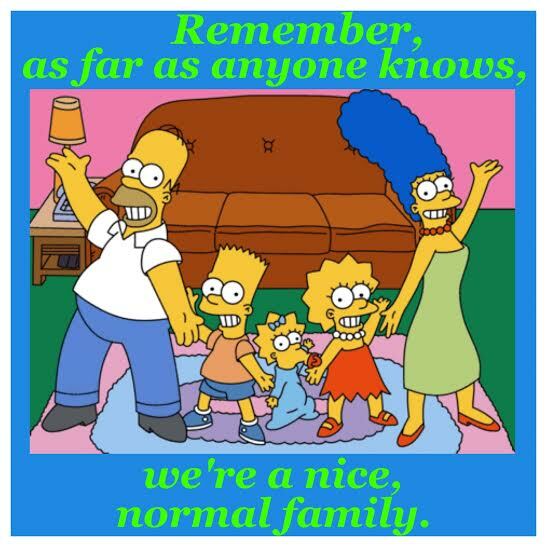 Oh, but there is one minor exception. Never, ever lick other people’s pets, no matter how cute that pet is or how sad/depressed/lonely you are.